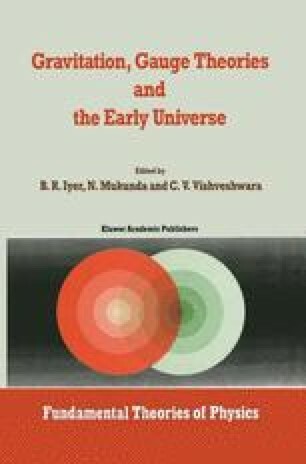 It is perhaps not wrong to consider Einstein’s 1917 paper on cosmology as the beginning of modern cosmology. It was a peculiar beginning for a branch of physics. Normally, one has some observational data and the theoretician goes on to build up a structure with a minimum of ad-hoc assumptions which help to systematize and ‘explain’ the data. In 1917, Einstein had hardly any observational data to explain and the little he had, he chose to ignore. Even at that time, it was clear that processes are occurring on a large scale leading to a flow of radiation from celestial bodies and, thanks to the ideas of the special theory of relativity, this could be understood as a continuous change in the distribution of sources of gravitation. Besides, it was already known that matter and radiation, even of the same energy density, differ in their energy-stress tensor. All this was enough to indicate that the universe, even if in equilibrium at the same stage, would not continue in that state. Yet Einstein adopted the assumption of a static universe which was also uniform in space and isotropic.